DESCRIPTION: Notice the broad head and the bulging, dark orange eyes. I think this snake looks kind of friendly..
Brown water snakes are nonvenomous snakes that live in the Coastal Plain and Piedmont regions from southern Virginia all the way through the Florida peninsula. They can grow up to 60 inches and are heavy bodied. Brown water snakes are light to dark brown and have three lines of black splotches from head to tail; one line going down the spine and the other two on either side of the body. 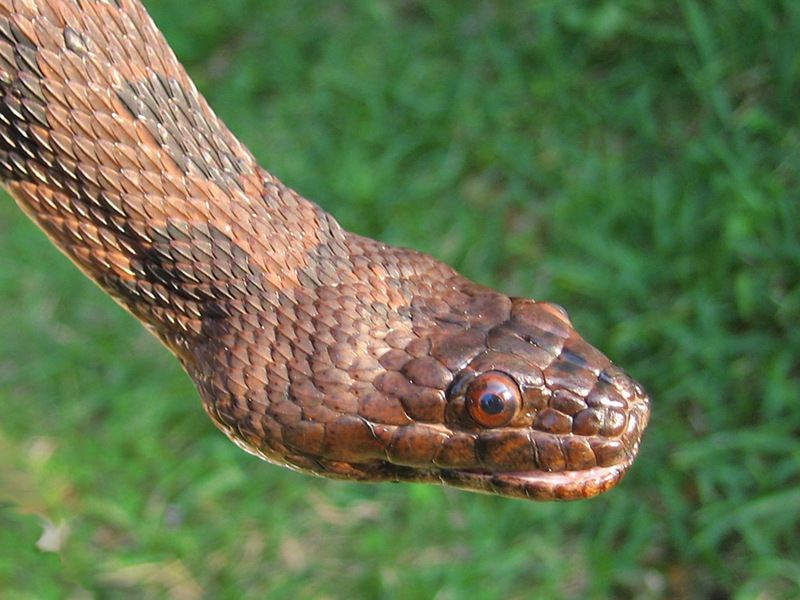 Brown water snakes have a slightly triangular, narrow head that is clearly larger than its neck and their eyes are high on their head, very close to the tip of the nose. Because of the shape, they are frequently mistaken for cottonmouth snakes. The females are significantly larger than the males of the species. The habitat brown water snakes include permanent water sources like blackwater cypress creeks, canals, rivers, and lakes. They are quick and agile swimmers, and feed on fish by foraging along the edges and bottoms of water sources or ambushing unsuspecting prey. They are rarely seen moving across dry land and rarely leave the water’s edge. Instead, they stick to leafy overhangs, river banks, and rocks to sun themselves on. If they are caught off guard by a canoe coming down the river and startled, they will drop out of the tree and possibly into the canoe. They will bite if they are cornered, so use caution when dealing with them. Brown water snakes mate in the spring and the females can give birth to up to 60 live young in the summer.